At Dennis McBride Sales and Marketing we provide a range of garage consumable products that go hand in hand with our Lubricants and Greases in NI. 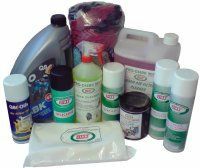 Under our BDT brand we offer solvents, cleaners, lubricants and several paints in aerosol form, also engine and radiator products as well as a disposable range of products including latex and nitrile gloves. * Please have a look at the dedicated pages for these highlighted products. They are a few of our key products and represent well, the genuine quality that we provide throughout our whole product portfolio and the services we provide. Pro-Clean 2000, Fuel System Cleaner, Oil System Flush and Heavy Duty Stop Leak. We have went into more detail with a few of the products from above with their own dedicated pages. The Pro-Clean 2000 is a concetrated cleaner that has limitless uses. The Fuel System Cleaner is a complete fuel system and injector cleaner and conditioner for petrol or diesel engines. The Oil System Flush is a new generation. low VOC product that removes oil sludge and prolongs the life of the new engine oil going in. The Heavy Duty Stop Leak is a fast acting and cost effective solution for sealing small holes and hairline cracks in all types of radiators. Get in touch with us today if you are looking for garage consumables in Northern Ireland. You can call us on 02892 639 653 or email us at info@mcbridelubricants.com or through our contacts page on our website. Thank you for your time and we hope we can be of service to you in the near future.